This is where our entire family spends quality time together. we asked the design team to comfortably fit as many people into the house as possible, To make it beautiful but not formal. we wanted it to be beachy and effortless. Stacy asked great questions, and everything was designed exactly for the way we live and entertain. We love to gather—it always feels kind of like summer camp. Everyone’s children love the bunk rooms. For the living area, we have a huge U of seating—it’s more than 30 feet long—complete with hidden task lights and charging outlets. We like to lounge and read, and some of us like to game. 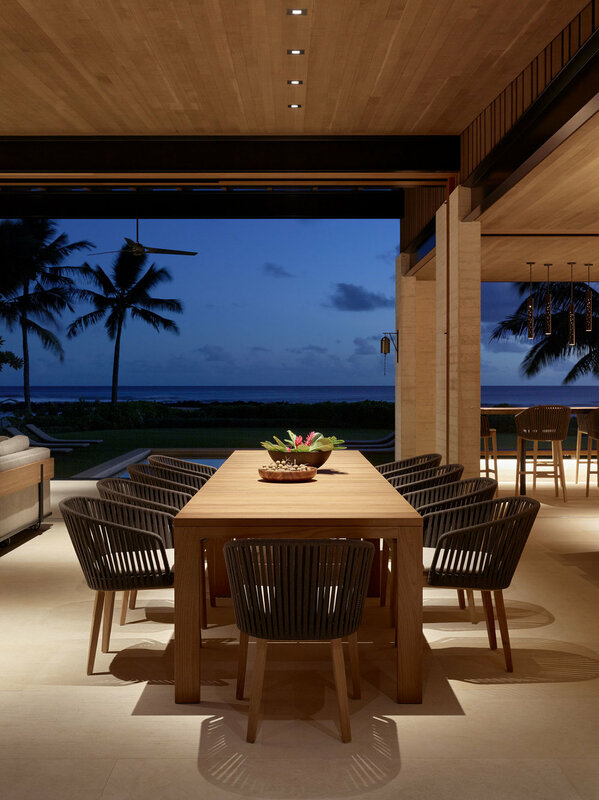 Stone Interiors also designed two companion L-shaped sofas that glide on casters, so we can wheel them onto the lanai to watch the sunset. It’s brilliant. The four ottomans we put our feet up on during the day convert to perfect cocktail tables in the evening with tray-tops Stacy designed to fit over them. We use the lanai all the time. This place is magical. It's multi-functional, and, to us, it’s nirvana.